Little known fact: Canon's range of digital Ixus cameras turned 10 in May this year. 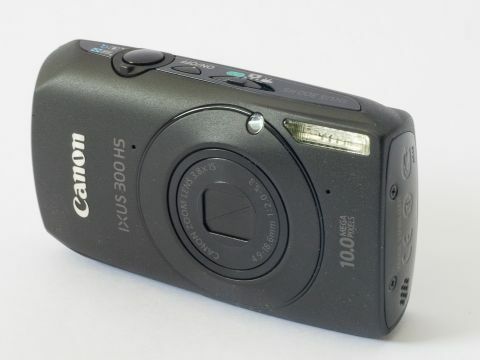 Since then, cameras such as the Ixus 105 IS and 200 IS have made a huge difference to consumer photography. The 10-megapixel Canon 300 HS is another step up for pocket-sized photography - a small, beautifully-designed camera with stonking image quality and a massive feature list. And, with an f/2.0 lens and maximum ISO of 3200, it promises excellent low-light performance. We're big fans of the design. As we've come to expect from Canon's glamorous Ixus line, it's svelte, at 54mm high, and its 100mm width makes it easily pocketable. The matte black finish on our review model proved a little more divisive, with some concerned it could be more prone to scratches if slipped carelessly into a pocket already occupied by a set of keys. It does feel well-made, though. The metal chassis feels like it will resist dents and fractures, and although the 300 HS is small, it's easy to grip without feeling like you're in danger of dropping it.